Extends automatically when you open your RV door and retracts automatically when the ignition key is turned on. 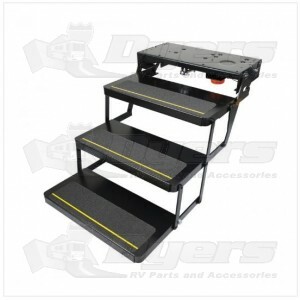 The Kwikee 23 Series Triple Tread Electric Step by Lippert Components automatically extends when you open your RV door and retracts when you close your RV door. The power step will automatically stop if it strikes an obstacle. Weatherproof wiring and connectors prevent shorts and corrosion in the system.